Image via Wikipedia The Manila US Embassy lauched last July 25 a Visa Reissuance Program (VRP). Those who are qualified for this program will have his Visa renewal fast tracked. If qualified, applicants need only to schedule an appointment, appear at the Embassy at the appointed time, and then have the application screened and give 10-print fingerscans. No need for an interview, and appointments are available within a few days! 1. I am a Philippines passport holder. 2. I have previously been issued, in Manila, a full-validity visa (a visa good for five or ten years). 3. My visa is still valid... or it has expired within the last twelve months. 4. I have in my possession all of my passports covering the entire period of time since I received that full-validity visa. 5. I have not been refused a U.S. visa in the last twelve months. US Geological Services (USGS) reported that a magnitude 5.9 earthquake that hit the island of Luzon, Philippines at exactly 01:15:44 AM, Tuesday, July 26, 2011. The location of the epicenter is at 15.07N,120.16E (epicenter), west of Angeles, Pampanga and north of Olongapo City. As of the moment, there was no reported casualties and the extent damage is yet to be determined. Here's the official bulletin from the Philippine Institute of Volcanology and Siesmology (PHILVOLCS) regarding July 26, 2011 earthquake. DID YOU FEEL THE EARTHQUAKE? Please leave a comment. Image by thepocnews via Flickr The Macanang Palace declared yesterday tha August 29 and 30 will be non-working holidays in celebration of the National Heroes Day (August 29) and Eid'l Fitr or End of Ramadan (August 30). This is in line with Proclamation No. 84 issued by President Benigno "NoyNoy" Aquino III scheduling all holidays for this year 2011. This means a long weekend on the last week of August 2011. However, for those who will be required to work during those dates should be compensated based on Labor Code requirements. Rebecca Black's Second Phenomenal Video "My Moment"
I think many of us would agree that we once thought that Rebecca Black is just another one-time hit maker and it's just "luck" or "favorable coincidence" that led her "Friday" music video on top of YouTube's greatest hits list. But now, I think we need to reconsider that young lady, especially now that she released her second video entitled "My Moment". "My Moment" was released just this week, July 18, 2011 and after just three days since its You Tube debut, the video had already crossed 10 Million hits! And here's one more interesting thing about this video: it obviously was aimed against her critics! Yes, you can clearly see that in such lines as “Weren’t you the one who said I was nothing? Well, I’m about to prove you wrong.” and "Haters, said I’ll see you later". Image via Wikipedia The Department of Education (DepEd) announced earlier today that there will be no classes on all levels (from Kinder to Highschool level) on Monday, July 25, 2011 due to the State of the Nation Address (SONA) of President Benigno "Noynoy" Aquino. For tertiary/college level though, the Commission on Higher Education (CHED) is yet to make an announcement. There will also be a traffic rerouting in the Commonwealth area affected by the President's second SONA. Low-cost airlineAirphil Express announces today that they are giving away 20% student discount on all domestic flights. This adds up to other existing discounts such as that of Senior citizens, persons with disability and infants without seat. The discount is only available for those who will book via Airphil Express ticketing offices. The student shall be enrolled by the time of the booking and must present their valid school ID or registration forms. Google Plus Invites Available Now! 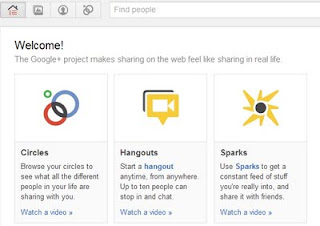 It seems that Google is intermittently opening and closing the invite capability of their newly introduced social network named Google Plus or simply Google+. Yesterday, it seems to be working after almost a week after the first shut-down of the invite mechanism. After few hours though, probably 5 or 6 hours, they closed the invitation mechanism again. Now, as of checking at (8:45 AM , Manila Time), the invite mechanism is apparently working again. For those who would like to be invited, just put a comment below. Please provide your email as well. Circles. You can sort out your friends to different groups so as to enable you to easily limit the information you share to certain people. This is a great step with regards to privacy.